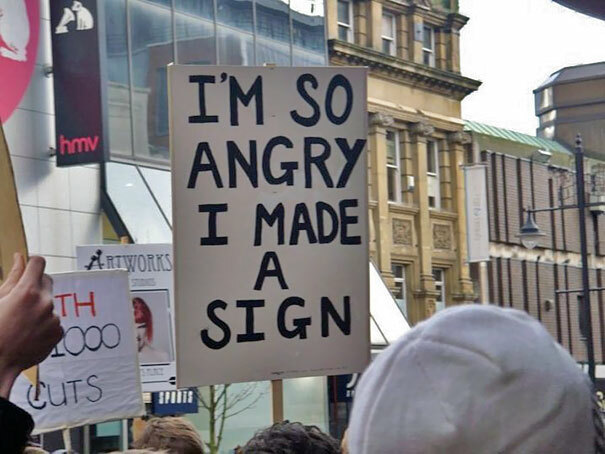 Does anyone have any good suggestions for a placard for the march tomorrow? "Pulling out early rarely works"
Big red V in a circle on a black background, and wear a guy fawkes mask. Ideally, bring about a million masks with you. We have EU flags - if I have time I will make a "We EU" sign. "we don't want to be part of a German dominated 5th Reich. Unless Turkey is in"
My favourite protests are still when a farmer decides to do a drive by on an office with a slurry spreader. Maybe if the ERG has an office that could be done. Perhaps rather than placards, it could be suggested that each attendee simply takes a dump in Parliament Square Green. Parliament has been sh1tting on us, the favour should be returned. "I want to show I'm superior to all those terrible Brexit people." How about "We didn't save you from two world wars for you to give us short shrift, EU ungrateful cunts!"? Picture of John Bull lying on his back with various EU member states national stereotypes (e.g. leprechaun, garlic bulb, bratwurst) standing round him having just jizzed all over his face. a portrait of jrm in crosshairs with slogan "we know where you live"